TopTracker is a time tracking app created by the team behind Toptal, which lets freelancers track the amount of time they spend working on client projects. With features like timed screenshots (helping clients and managers track activity) and a project overview dashboard, TopTracker helps to maximize freelancer productivity and make sure that projects run smoothly. While TopTracker provides basic features that are accessible to everyone, sometimes you require software that’s more feature-rich and can transform the way you work and manage. Thankfully, there is a whole range of feature-packed time tracking software alternatives that provide just the thing. We’ll take a look at 5 of the best TopTracker alternatives below. Hubstaff is powerful time tracking solution that’s perfect for managing remote teams. It can help you dramatically increase your team’s efficiency and productivity, and it can seamlessly integrate into your existing work processes. With Mac, Windows, Linux, and iOS applications, it is a perfect tool for teams no matter which device they’re using. Hubstaff allows you to track work progress with optional screen capture once, twice or three times during each 10-minute span. Know exactly where a project is at any time, and jump in to help if you see someone hit a roadblock. You can also view activity levels for your employees, freelancers and contractors to see how productive they are while tracking time. Managers can monitor the applications and websites that employees use and visit during the day to pinpoint potential distractions, and highlight helpful resources. It also allows you to set time and budget limits on individual projects, so you never get an unwelcome surprise when it comes to billing. What’s more, Hubstaff also automatically works out invoice amounts for each person, and can automatically process payments through Transferwise or Payoneer, which are calculated using your team’s hourly rates and the amount of tracked hours. To make project managing and time tracking easier, Hubstaff integrates with more than 30 leading project management solutions like Asana, and also allows you to track the time your team spend in apps like Salesforce and Zendesk. Pulse.red is a time tracking software that aims to make time tracking completely hassle-free. 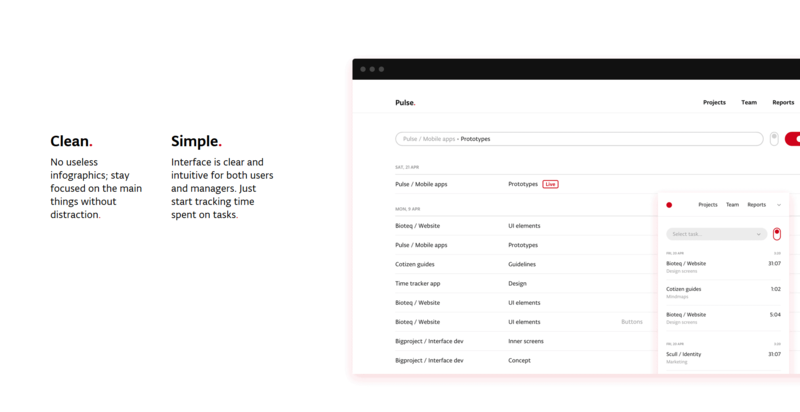 With a minimalistic yet beautiful interface, Pulse.red is perfect for those who simply want to keep track of how their team spends their time at work. In terms of overall features, Pulse.red isn’t as powerful as other time tracking apps. However, it is extremely easy to learn, as well as fast and responsive. You don’t even need to keep a browser window open to keep using it; Pulse.red can be minimized into a tray application so you can stay focused on your tasks easier. Pulse.red shows the total hours worked by your team and the time budgeted for each project so you can see if any task is over the budget limit and make the right adjustments. It even shows the device each team member is working on. If straightforward time tracking is all you need for your team, then Pulse.red might be the app for you. The software costs €4 per user monthly. Clockspot is a web-based timesheet software best suited for office employees. ClockSpot lets you see what each of your team members is working on in real-time, so you can stop worrying if they are making progress and focus on the more important tasks at hand. Clockspot’s timesheets show the hours worked by the team, and the time they have started and stopped working. The calendar lets you see who is scheduled to work on the days of the month, and allows you to adjust schedules for multiple or individual team members. This is certainly a useful feature for office setups, but Clockspot lacks the flexibility to accommodate freelancers and remote workers who do not follow schedules and work whenever they can. Clockspot can process payroll based on the hours worked by the employees, as well as deductions and overtime hours. Despite not having an automatic payment feature, this can still save you significant time on computations. The employees can view the payslips as well, so they can see where the time they spent working went. 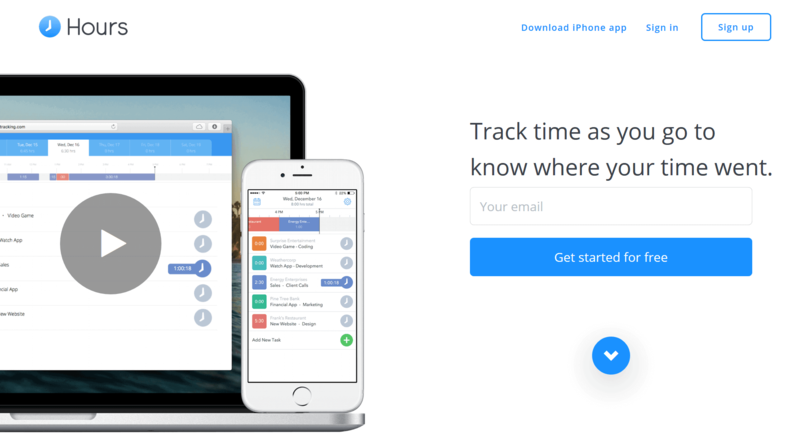 Hours is a web-based and iOS time-tracking app that lets freelancers and individuals track time in an attractive and easy-to-use app. Hours has a limited set of features, but what features it does offer, it executes well. With Hours, you can map out your whole day by breaking a calendar-style overview down into chunks of color-coded time, either after or ahead-of-time. This is great for visual people who want to be able to see what their day looks like at a glance, and allows for effective time tracking without the need for complex features. While Hours provides the core functionality of time tracking, it falls short when compared to more advanced time tracking software like Hubstaff. Hours doesn’t monitor applications, record activity levels, or allow you to compare employees like-for-like. It also lacks some of the automation like payroll and invoicing that saves business owners time and money. Tick is a time tracking software designed to help you manage your projects better, as well as your virtual teams. Tick tracks the time your team spends on their respective tasks with just the click of a button. Tick treats time as inventory, which is why it describes itself as more of an inventory management system than a time tracking software. The software comes with a budget tracking feature so that you know when the project is about to cost you excess time and money. From there, you can make timely adjustments and informed decisions. Tick also has a powerful reporting tool, but doesn’t have invoicing and payroll capabilities. In other words, you still have to do these manually, or find another software to do the job. Tick can integrate with a number of the top project management platforms, but it works especially well with Basecamp. 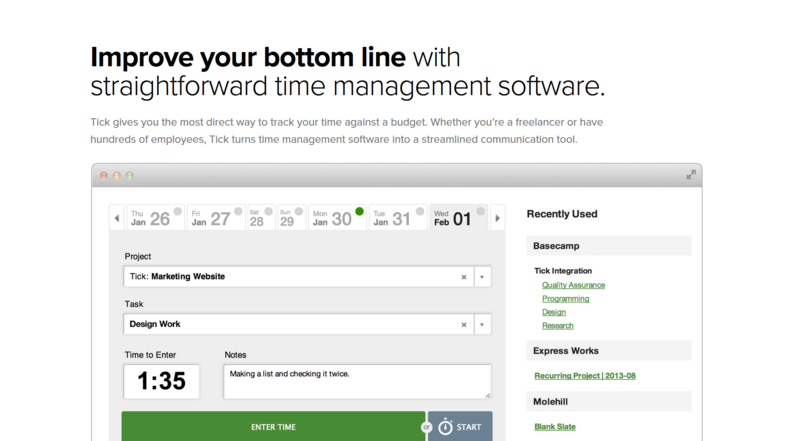 Tick is great for those who are looking for time tracking and reporting software, and are actively using Basecamp in their work. Using time tracking software like TopTracker is a great way to monitor your team’s performance, maximize billing, and avoid invoice and payment disputes. Being able to track the time freelancers, contractors and full-time employees spend working on projects accurately can help you understand which areas of work take up most of your time, and give your clients security and peace-of-mind. They’ll know that the hours billed are hours worked, with proof of work recorded. Being able to track what your team is working on at any given moment, how long your team members spend completing milestones, and what apps your team uses during the workday can help you to make smarter management decisions. It can also help inform performance reviews. Time tracking apps aren’t only an incredibly powerful tool for project managers and team leaders, they’re also useful for freelancers. Being able to show progress easily and without having to check in allows freelancers to focus more on their work, and less about keeping tracking of hours. Which TopTracker alternative will you try? All of the time tracking apps above offer great solutions for everyone from individual freelancers to agency teams and project managers. They come with feature-sets and pricing structures to suit every budget and requirement. We love using time tracking software like the ones listed above, and find that it’s great for employers and employees to dramatically increase productivity and efficiency. If you’re still on the lookout for a TopTracker alternative, check out our extensive list of reviews of time tracking software where we’ve reviewed over 30 different solutions. This post was originally published May 2016, and updated January 2019.